Photo Caption A: The playing of the National Anthem opened the ceremony at the Berkeley College 5th Annual Salute to Veterans Gala, held in Garfield, NJ, on April 6, 2017. The Berkeley College 5th Annual Salute to Veterans Gala took place at the Venetian in Garfield, NJ, on April 6, 2017. 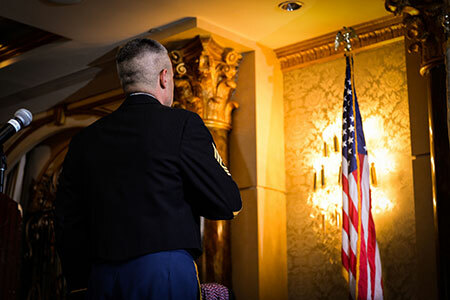 More than 300 attendees gathered to recognize the sacrifices and achievements of U.S. service men and women at the event, hosted by the Berkeley College Office of Military and Veterans Affairs (OMVA). Honoring the largest class to date of 188 graduating military and veteran students from Berkeley College, graduating seniors were given red, white and blue honor cords to wear during the Commencement ceremony on May 5 at Prudential Center, in Newark. Photo Caption B: On the left, Berkeley College student-veteran Idrees Dukes of Rahway, NJ, addresses attendees at the Berkeley College 5th Annual Salute to Veterans Gala, held in Garfield, NJ, on April 6, 2017. On the right, Berkeley College student-veteran Leah Minnucci of Lansdale, PA, receives a red, white and blue honor cord, given to graduating student-veterans to wear during the Commencement ceremony on May 5 at Prudential Center, in Newark, NJ. Byron Hargrove, PhD, Professor, Humanities and Social Sciences, Berkeley College School of Liberal Arts, and Director, Honors Program, received the Faculty Award. In presenting the award, Maja Monique Mendez, Assistant Director, OMVA, acknowledged Dr. Hargrove’s work as a caring teacher, helping those in need, and offering a shoulder for the support of students. Keynote speaker Brittney Hogan, Gold Star wife and creator of Virago Fitness, shared her story of love, devotion, anger and redemption. Ms. Hogan’s husband, Marine Lance Corp. Hunter Hogan, died on June 23, 2012, while conducting combat operations in Helmand Province, Afghanistan. He was 21 years old. 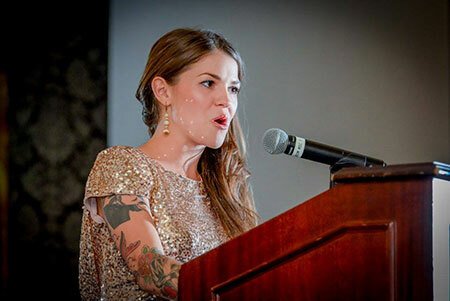 Photo Caption C: Brittney Hogan, Gold Star wife and creator of Virago Fitness, delivers the keynote address during of the Berkeley College 5th Annual Salute to Veterans Gala, held in Garfield, NJ, on April 6, 2017. Thus began her motivation to inspire others to use fitness for post-traumatic growth. Her goals for Virago Fitness include producing athletic wear made in the United States in a facility that primarily hires veterans and their families as employees, as well as providing free fitness classes throughout the country for people who are struggling. To honor her late husband, who loved the rodeo, Ms. Hogan also started a charity fund that donates $1,000 scholarships to rodeo high school seniors. Today she is remarried and has two young step-sons. The Berkeley College OMVA also introduced Skyla, an emotional support dog in training. Skyla has joined the OMVA staff to assist veterans who suffer from post-traumatic stress disorder, anxiety, and depression or panic attacks. On April 20 and 21, 2017, “One-on-One with Steve Adubato” will welcome Dr. Robitaille and Tami Pichardo, Director, Veterans Affairs, OMVA, Berkeley College. The segment will air on April 20 at 5:30 p.m. on WHYY and at 7 p.m. on NJTV, and on April 21 at 1 a.m. on Thirteen/WNET. Click here to learn more about Skyla. During a night of celebrating acknowledgments and remembrances, a poignant highlight was the unveiling of the Veterans and Goldstar Reflections projects. The gallery of photos was created by the OMVA staff with student veterans and families of veterans, contrasting their lives before and after their respective service experiences in one picture. A collection of new recordings for the Veterans History Project, associated with the U.S. Library of Congress, was also shared on a number of large screens. Photo Caption D: The Veterans and Gold Star Reflections projects were unveiled during the Berkeley College 5th Annual Salute to Veterans Gala, held in Garfield, NJ, on April 6, 2017. 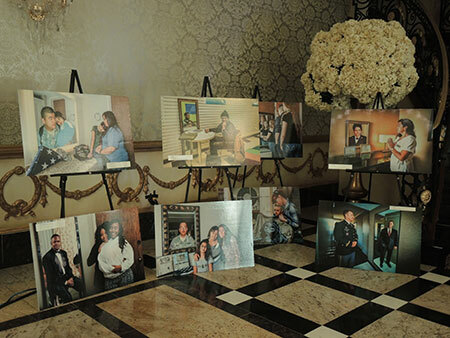 The gallery of photos was created by the Berkeley College Office of Military and Veterans Affairs with student-veterans and families of veterans, contrasting their lives before and after their respective service experiences in one picture, using a mirror theme. Berkeley College participates in the Yellow Ribbon Program under the G.I. Bill and collaborates on national ventures with the National Guard, the Army and the Air Force, the GoArmyEd distance learning program, and the Navy College Program Distance Learning Partnership. The OMVA provides support to its student-veterans through six on-site veterans resource centers (VRCs) in New Jersey and New York, as well as through an Online VRC. At the VRCs, military students can meet with staff, network with their peers, and learn about Veterans Administration benefits. Click here to learn more about the Berkeley College Office of Military and Veterans Affairs. Berkeley College was recently designated as a Top 10 Military Spouse Friendly School in the nation by Victory Media, originator of the family of Military Friendly® resources for veterans and their families. The designation came shortly after Berkeley College earned a 2017 Military Friendly® Award and was ranked a Top 10 Nontraditional School for outstanding commitment to, and programs for, veterans and their families. Berkeley College has also been recently named to the Military Times “Best for Vets: Colleges 2017” list for the fourth time, as well as ranked among the Best Online Bachelor’s Programs for Veterans by U.S. News & World Report for the fourth consecutive year, placing at No. 65.